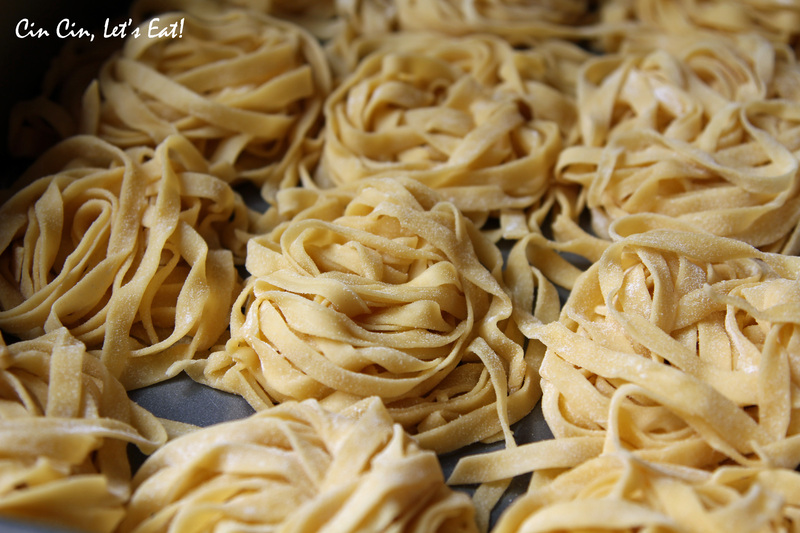 Fresh Pasta with Black Truffles [recipe] – Cin Cin, Let's Eat! I used Anne Burrell’s recipe from her cookbook (it’s a great book!) and the recipe is also posted on Food Network’s website. I followed it to the T and kneaded the dough by hand. Next time I will use my kitchen aid mixer’s kneading hook and compare the results. Although kneading the dough by hand is SUCH a great workout. From a well of flour to a velvety and shiny ball of dough. That’s almost 15 minutes of kneading!!! And since i’m short, I stood on a stepping stool to knead – it’s much easier to put my whole body strength into the kneading. 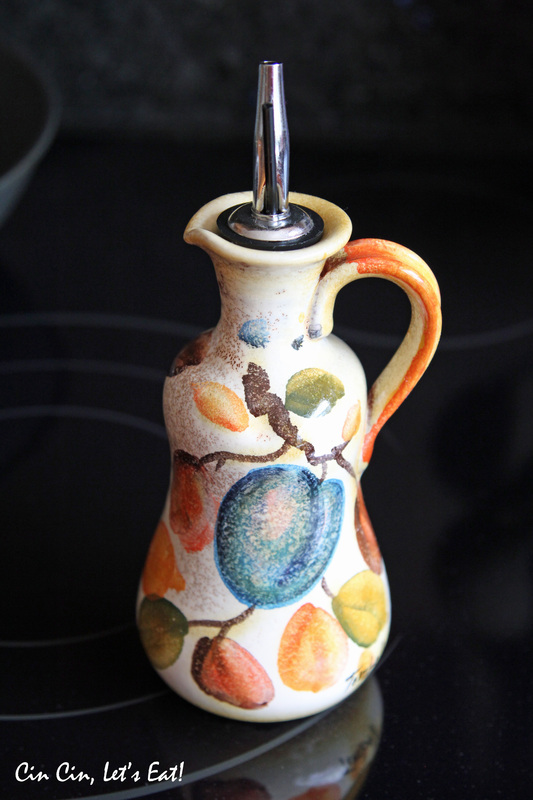 Gotta show off my lovely bottle purchased from Italy, which now holds quality extra virgin olive oil. Put the flour on a clean dry work surface. Make a hole (this is also called a well) in the center of the flour pile that is about 8 inches wide (bigger is definitely better here). Crack all of the eggs and the yolk into the hole and add the olive oil, salt and water. Using a fork beat the eggs together with the olive oil, water and salt. 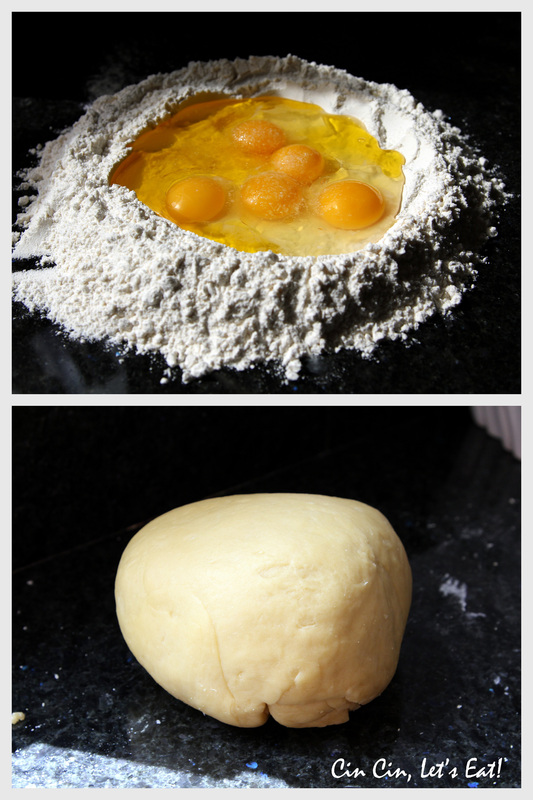 Using the fork, begin to incorporate the flour into the egg mixture; be careful not to break the sides of the well or the egg mixture will run all over your board and you will have a big mess! Also, dont worry about the lumps. When enough flour has been incorporated into the egg mixture that it will not run all over the place when the sides of the well are broken, begin to use your hands to really get everything well combined. If the mixture is tight and dry, wet your hands and begin kneading with wet hands. When the mixture has really come together to a homogeneous mixture, THEN you can start kneading. When kneading it is VERY important to put your body weight into it, get on top of the dough to really stretch it and not to tear the dough. Using the heels of your palms, roll the dough to create a very smooooooth, supple dough. When done the dough should look VERY smooth and feel almost velvety. Kneading will usually take from 8 to 10 minutes for an experienced kneader and 10 to 15 for an inexperienced kneader. Put your body weight into it, you need to knead! This is where the perfect, toothsome texture of your pasta is formed. Get in there and have fun! When the pasta has been kneaded to the perfect consistency, wrap it in plastic and let rest for at least 1 hour. If using immediately do not refrigerate. 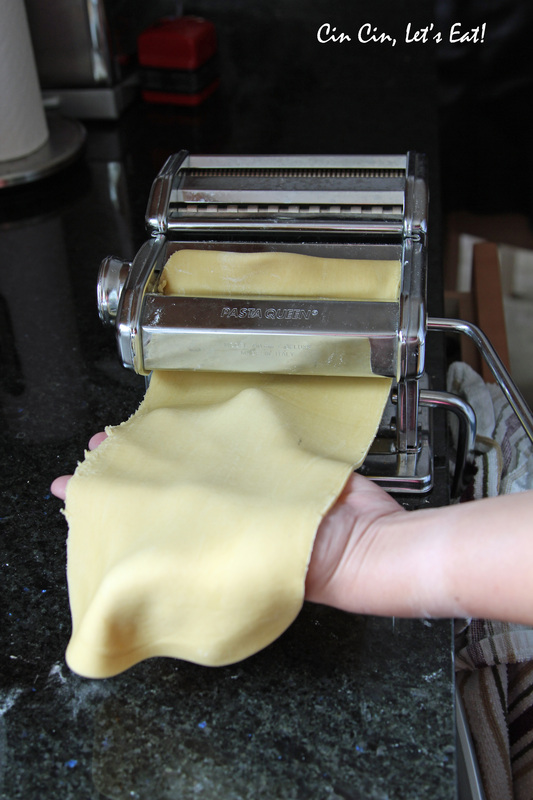 Roll and cut the pasta into desired shape. 1. Start with a quarter of the dough, and start with #1 setting. Use plenty of flour so the dough will not stick. If your dough is sticking to the machine, it is too wet. 2. Once the dough goes through the machine, fold it in half, dust it with flour, and roll it a couple more times. 3. Switch to #2, roll. No need to fold. Then switch to #3, #4…so on. Remember to dust with flour each time. For Tagliatelle you have to go to #5 or even #6. I went up to #6 this time and liked how the thickness turned out once the pasta is cooked. Next time I will stay at #5 and see how I like it. 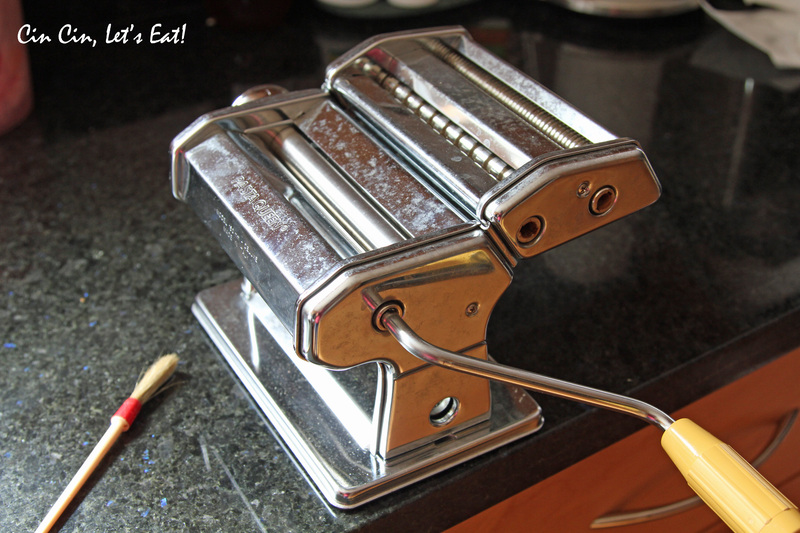 Here are some sites I came across that have very detailed information regarding making fresh pasta. Little nests! I don’t have a drying rack, and plus I was cooking these on the same day. I dusted them with plenty of flour so the strands wouldn’t stick to each other. Twirled them into little nests and cover them with plastic wrap, these can last in the fridge for 2 or 3 days. 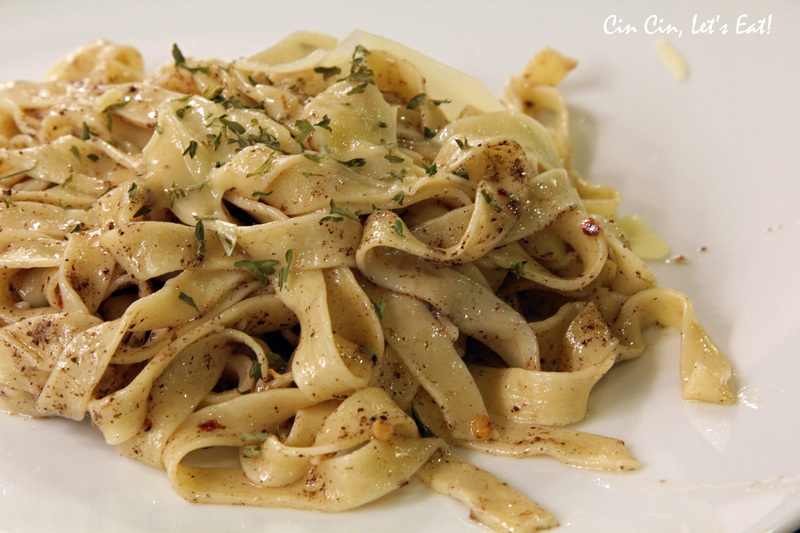 And to make that delicious tagliatelle al tartufo, I used this recipe from Chow. Since I couldn’t find any fresh truffle right now, I bought a small jar of truffle pate from Whole Foods. Turned out to be quite decent! This takes no time to make, and fresh pasta cooks super fast! If you are a truffle and pasta lover like me, make this ASAP! And please don’t frown when you read about the anchovies in the recipe. All it adds is the extra layer of depth and savory quality, not fishy at all. Heat the oil and butter in a large frying pan over medium heat until the butter foams. Add the minced truffles, anchovies, garlic, red pepper flakes, and black pepper and cook, stirring often, until fragrant, about 1 minute. Remove the pan from heat and set aside. Drop the fresh pasta into the boiling water and cook until al dente, about 2 minutes. Using tongs, transfer the pasta directly into the reserved frying pan. Add 1 cup of the pasta water and toss over medium heat until the sauce thickens slightly and the pasta is coated, adding more pasta water by the tablespoon to reach the desired sauce consistency. Remove the pan from heat, add the cheese, and toss until the pasta is well coated. Taste and season with additional salt and black pepper as needed. Divide the pasta among 4 or 6 serving bowls and thinly shave or slice the remaining truffles over the pasta. Serve immediately. i’m hungry all over again… the fresh tagliatelle was phenomenal! lol, at least buy fresh pasta for this. Pingback: Mushroom Ravioli [recipe] | Cin Cin, Let's Eat!